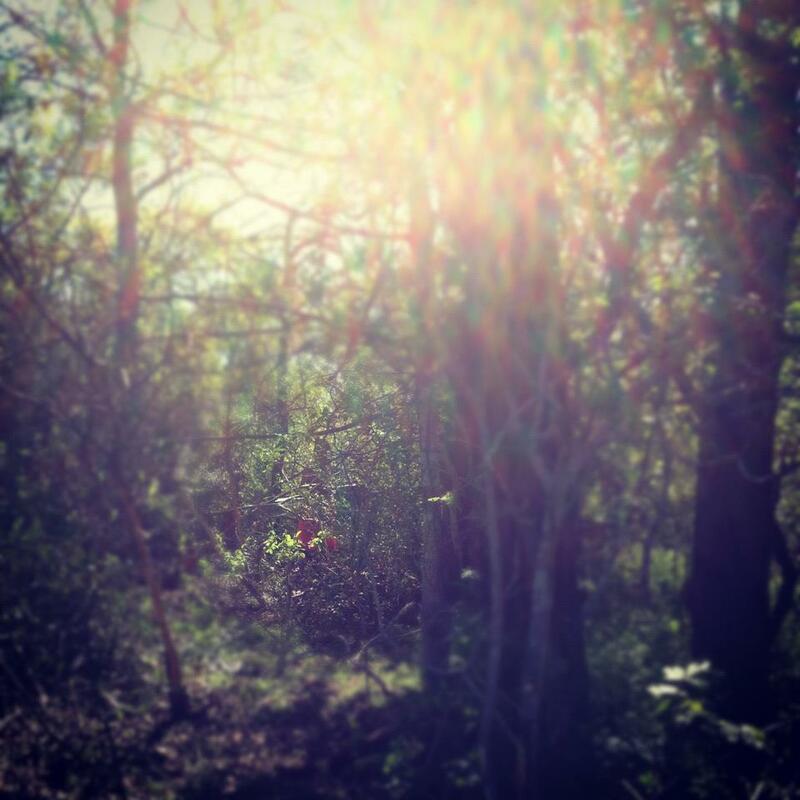 The longer you live, the more you find yourself having those moments. You watch yourself miss a wreck by mere seconds. You have a doctor give you that whole, "It could totally be cancer or it could totally be something really not anywhere near the scariness of cancer." Life brings lots and lots of great experiences, and more and more near misses. Almost exactly one year ago I took a day away from home to do some self-care. I spent time with a friend, enjoyed a great hike, hooped at Barton Springs. 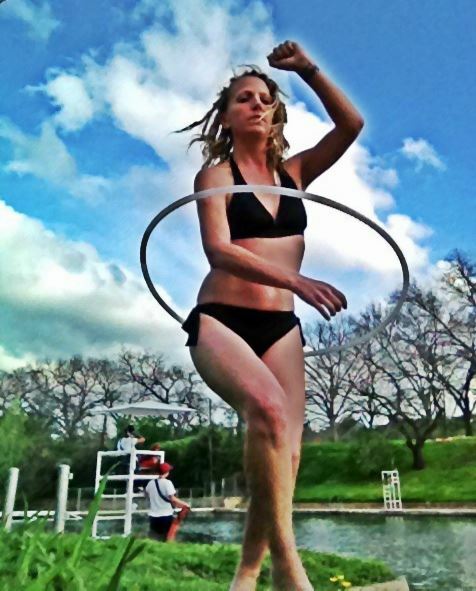 I was in the middle of a hooping challenge, and took one of my favorite pics that afternoon. About 10:30 pm that night, I was about five miles from my house, and hydroplaned off the road going 70 mph. I flew through a grove of trees, which eventually brought me to a stop. I'm pretty sure the whole thing just lasted about ten seconds (if that?) but I remember what felt like minutes of watching and feeling trees flying past me, the things that I was yelling and thinking and waiting for the big crash - the big tree that I figured was inevitable. I never hit that tree. I hit all the others, but not the big ones. And then everything was still and quiet. There I sat in my car. Surrounded by trees. Lights on. Phone still sitting perfectly in the seat beside me, connected to the charger. Purse still sitting in the seat beside me. I think I paid attention to the fact that no air bags deployed. I saw that the windshield was shattered, but I didn't even feel any burn or pain from the seat belt. I didn't remember anything painful happening to my body. So, I put the car in reverse and tried to back out. Really. Hmmm. In shock, much? I actually thought, "Maybe I can just back out of here and drive the rest of the way home. No one has to know." I felt a lot of things at the same time. I called my husband. Someone living across the road had already called 911. My phone's GPS helped Michael locate me because ... well, I was way off the side of the road. A climb out of a window, an eventual bad case of poison ivy (which would show up in a few days), one tow truck, two sheriff's deputies, zero physical injuries and $8000 worth of damage to a car not worth $5000. I waited a year to really talk about it because, even now, it's a struggle. Not because it could've totally killed me. Instead, it's this overwhelming feeling of embarrassment over the whole thing. Embarrassed. Huge feelings. I told people in my life over those next two weeks, but I was very selective in who I told. Even now it fascinates me to think about that short list. People that I knew wouldn't say something stupid (cause when traumatic things happen, people get ancy and say stuff that actually hurts more than helps, and it almost always involves God ... and the word "co-pilot"). People that knew parts of me better than others, and would understand why I needed to tell some people, but not all people. Okay, back to the embarrassment part. It took me awhile to figure out what was going on with that. Sure, I was embarrassed that I totalled one of our cars and it inconvenienced us in several ways for several weeks. I had to tell my kids, and I hated that I was bringing more trauma into the lives of these amazing humans who still struggled just with being close to their parents. I knew this would cause an increase in behaviors for quite awhile (and it did). That's when it started to rise to the surface. I'm a helper. I'm a fixer. And I really struggle with letting myself be helped or fixed. It felt painfully uncomfortable to be comforted. It felt painfully uncomfortable to be comforted. I knew that telling my parents meant that my parents had to sit and think of what could have happened. And it sickened me that they would have to have those moments. I saw what it was like for my husband. He knew something horrible had happened the second he heard my voice. He got in the car, on the phone with me, but not knowing what exactly he was about to find when he reached me. Same with my friends. My original Orlando girls ... telling them ... I had to. They want to share in my life. But I knew that each of them would sit with it and imagine it all the way through and feel it, and I didn't like creating that situation for them. That kind of pain. Even if it was just in thought and it was brief. 1) If I had died last March, I would've been completely at peace with how I have lived my life, even in all of my flaws and mistakes. I have not wasted my adulthood, and I am happy with what I've done, whom I've known, whom I've loved, where I've been and where I'm going each day when I wake up. Peace. I have such peace, even while still craving life. I am so happy I have lived my days in this way. So, very happy. 2) I want to be more open about how human I am. And that feels scary as hell. I am human (just noticed I was using the word "weak," and realized that I would absolutely confront others with that word, but here I was using it for myself - edit, edit, edit). I am not more human than the average person. Not at all. But I don't like people to see me as such. Well, let me correct that: I don't mind people seeing my struggles if it is helping them be stronger. But I hate for people to see my humanity and give of themselves to help me work through it. I like to always be the "fixer." It feeds me. It feeds me in a way that crosses over into an unhealthy place. I also need to be fed. I'm doing better, but I have a very long way to go. And yet, if a train runs me over this afternoon, I will still be at peace. I am living my life in a balance of play and service and growth and a good dose of self-care. I love that I did not have one single moment last March of thinking, "Had I not been out galavanting all over Austin that day, I wouldn't have had that wreck. I would've been at home." Nope. Didn't think that for one second. I would've died as a woman who was actively seeking balance and seeing herself as important. I could write for days. This experience still speaks to me every time I drive past that spot. I'm still learning from it. I'm saying it all out loud, and I still feel very embarrassed that I somehow "let it happen to me." I know, right? That doesn't make sense. Cause I'm like everybody else, and am screwed up in plenty of my own special ways because this body and brain keep walking around on this planet every day. It's inevitable. Sometimes I need to be fed and carried. I have slowly been leaning back into others this year and letting them do that for me. I have said through tears, "You feed my heart, and it feels really, really good." That was rare for me. I realized it shouldn't be. Last week, I looked at a child who has a terrible fear of me dying on a plane. I said, "I know you are afraid that I'm about to treck off to Orlando again for five days. I know this is hard. I am still going. It is important for me to go. I need this. This makes me better for you. And it makes me better for me." And I went. And that child made it through those fears. And I sat in a house full of women and did not teach a class or make myself available to help anyone with parenting problems. I let women speak truth to me and challenge me and feed me and fill me up. I let myself need them. That part of me that is afraid of allowing others to see the struggles ... that part started to die a little in the wreck that night. I'm scared to let it go completely. Scared to publish this stupid post. Cause I'm human. So, there ya' go. Look close. You can see my red dress, hooping in the spot where the car finally came to a stop. This shot was taken from the fence line. I went back two days later and hooped there, to reclaim that space. Give it some happy. A few days after that, I made this video. You are beautiful. In all your human and spirit filled ways. Thank-you, you really challenged me this morning and set off a train of thought that brought me to a very different place, that is somewhere I need to be. Since becoming a mother of a child with special needs the label "inspirational" gets applied to me often. My rejection of this label is almost visceral and I have struggled to accept and name why. There are a lot of reasons, but the new one I uncovered in reading this is - it silences me. Too often when people use that word, it is in an effort to stop me talking about the hard and the black and the scary and the exhausting and the bodily fluids and the mundane and to shiny it all up. I have let it silence me and have so few people I can be open and honest with now. So now I need to speak, and if someone tries to silence me, move on and speak again without retreating into my safe, dark shell. Ah bugger, there is a certain safety in the shell and a lot of scary out there. I hate it when you make the scary seem like it might be worth it. I LOVE the video - I have been listening to that song since discovering it on peacelovefree.com and so it especially spoke to my heart! I totally empathize with the embarrassment reaction to bad stuff that happens. I loved your photo and your hooping vid at the end. I had to go add the song to my running mix. Wow.... Just... Wow.I can absolutely relate. Love you. You are one of my "won't say something stupid" people too, friend. I miss a lot of your blog posts (I hit my blog list kind of haphazardly) but sometimes they have me wondering if you still hold any of the religious beliefs that you (most of us recovering southern Baptists) were brought up with. Not the "thou shalt not"s but the most basic like J3:16. You know. Maybe you've mentioned those things and I missed it. Cheryl, here is my post on where I have landed on talking about my beliefs publicly. I love you, sister. I really do. Thanks for sharing, it brought me to a place where something very similar happened to me and one kiddo. Glad you shared this, its hard being the parent and not wanting to be vulnerable to reality such as death. I am very glad to still have you around.. Although your writing usually speaks to me in vulnerable areas, this one could actually have been written *BY* me. Thanks for sharing and being vulnerable. The hooping? Wow. I so hope you posted this on youtube. I can see that going viral, like, overnight. this video has inspired me to try hooping this spring! I'm so excited to buy my first hoop! You are an amazing woman and I am continually inspired by you.